Simon is a Kent-based photographer who uses the medium to create distinctive, often abstract images that find easier comparison with some styles of painting and print-making than with photography as most people think of it. In this work, the traditional photographic virtues of sharpness and notions of capturing an 'accurate' record of the scene in front of the camera, yield to an expressive language of mood, tone, and shape. Dramatic seascapes, wild ink-like reflections, and dense forests are reoccurring subjects in Simon's work, which has been widely exhibited. 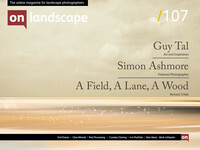 Simon Ashmore is less interested in accurately recording that which he sees than he is in combining subject, shape and tone using one or more images to create an impression. He has arrived at (or perhaps is currently visiting, as I get the sense that his work will continue to evolve) this point from a background in editorial photography via street photography. His aim is to encourage the viewer to see familiar things in a new light, and not all of his images are as they first seem. Can you tell me a little about your background – your education, interests and career? I had an unremarkable upbringing. Early childhood in the 70's - scruffy hair, The Sweeney, a chopper bicycle with gaffer tape holding the seat together. My recollections of adolescent life are of disillusionment and Thatcher. I was good academically, but I decided to leave school half way through my 'A' levels to study photography, thinking, as one does at that age, that I was destined to change the world. I became an editorial photographer at 19. I had no clue what I was doing. But I learned along the way. In spite of my choices, my lack of formal higher education caused me much frustration. Years later I went to university part time to study modern history, which I found really fulfilling. What first prompted you to pick up a camera and when did you become serious about photography?